Family vacations are a time to relax, unwind and let loose and the best location to do that is Alabama’s Gulf Coast. The beaches are beautiful and there is an abundance of restaurants and local activities to keep everyone entertained and well fed. Even in paradise, precautions should still be taken to keep everyone safe, and Gulf Shores and Orange Beach have systems in place to ensure beach safety. Here are the things you should know about the beach safety in Gulf Shores and Orange Beach to keep everyone in your party safe while on vacation. Rip currents are strong channels of water that flow outward from the shore into the Gulf of Mexico. These currents typically flow at 1 – 2 feet per second, but speeds up to 8 feet per second have been measured. There is a common misconception that the current pulls swimmers underwater, but the current is actually strongest at the surface and does not pull swimmers downward. Rip currents themselves are not necessarily dangerous, but the fatigue that comes from trying to fight the current is. In order to escape the current, swimmers should remain calm and swim parallel to the shore. 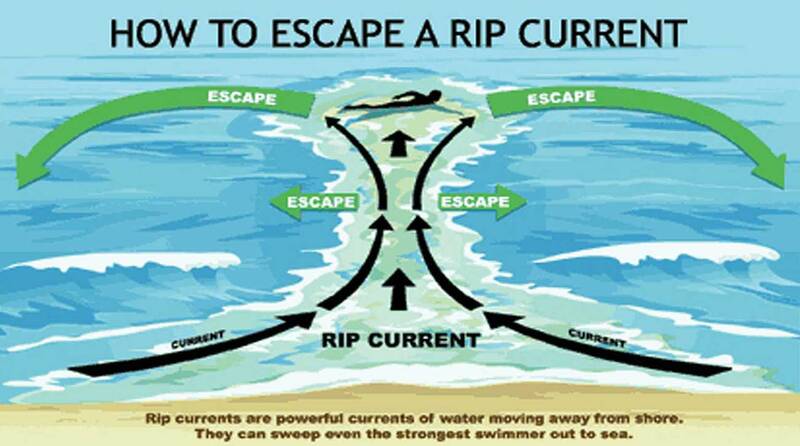 Rip currents tend to be narrow, so escaping by using this method is very effective. Swimmers can think of the current like a treadmill, and the best way to escape is to simply step off to the side. You can visit the NOAA website for more information on how rip currents form and how to identify them. illegal to enter the water. Swimmers will be ticketed if caught swimming when the double red flags are flying. Purple flags are flown when there is a dangerous marine life advisory, which usually means there is a high concentration of jellyfish at that time. Lifeguards are only stationed at the main Gulf Shores public beach (in front of The Hangout), and caution should always be exercised when swimming in the Gulf of Mexico. Waves can be much more powerful than you may think. While most injuries are minor (simple scrapes and sprains) they can still put a damper on your vacation. Luckily, it’s fairly easy to avoid these injuries while swimming. Always be aware of where the waves are breaking and never turn your back on the waves and you’ll never be caught off guard. Being informed is the first step in ensuring that everyone will be safe on your next trip to the beach, so be sure to share these tips with friends and family members. And most importantly, remember to always exercise caution when swimming in the Gulf so you’ll be able to experience a safe and fun family vacation. Don’t forget to check out our free 2014 Vacationer’s Guide for information on local restaurants, activities and more! Previous Post « What Steps Should You Take to Treat a Jellyfish Sting?